Government says it is committed to increasing the capital base of smallholder farmers in rural areas so that they can increase productivity and alleviate extreme poverty. Speaking during the handover of checks worth K81, 000 to two rural –based clubs in Itezhi Tezhi district yesterday in central province, Minister of Livestock and Fisheries Greyford Monde said the money was meant to finance projects aimed at promoting and increasing productivity in livestock. Mr. Monde told the beneficiaries that the money was from grants sourced from World Bank and that it were meant to empower them so that they can improve livestock production and contribute meaningfully to the development of the country. “Government is committed to fulfil its promises of improving the livelihoods of rural people” Mr. Monde said. 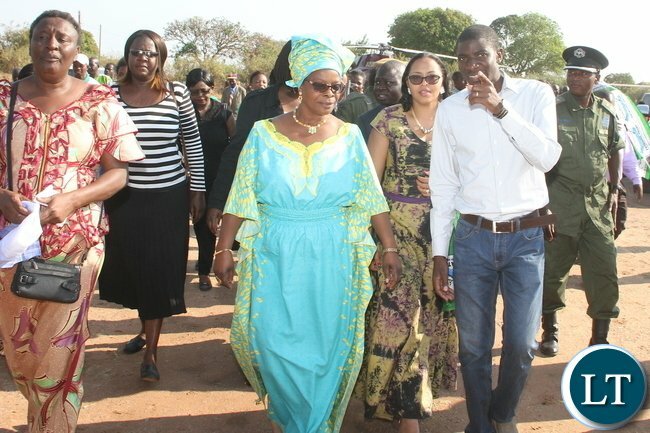 Government through the ministry will continue to fund viable projects that are capable of increasing livestock productivity which has a huge potential in improving food security and incomes, he said. He pointed out that matching grants are being used in agricultural and rural development to compensate for absence of affordable investment finance from local institutions adding that they can stimulate investment and agricultural activities among small and medium –scale farmers. “Government wants all eligible groups in all districts across the country to benefit from these matching grants in order to better their lives” Mr. Monde said. The groups that benefitted were Mundamano women’s club in Kaponde area in Chief Shezongo’ chiefdom which is involved in goat rearing and Shezongo Community Resource Board which is involved in pig rearing project. AND beneficiaries of the funds have hailed the government for the money. Kaponde area Development committee chairperson said people in Kaponde were grateful for the financial support provided to the successful clubs. He said that they will ensure that the money is used according to guidelines so that their project will be sustainable even after the money is exhausted. The minister was accompanied by the Acting Itezhi Tezhi district Commissioner Akatama Malikana and other heads of government departments.